Durango, CO, was founded in September of 1880 with the arrival of the Denver & Rio Grande's San Juan Extension from Alamosa. When the railroad arrived, most of the population was in Animas City, several miles to the north of Durango. Durango would eventually become the railroad nexus for the southwestern corner of Colorado. The Denver & Rio Grande - later the Denver & Rio Grande Western - has their main line coming in from Alamosa (the San Juan Extension), the Farmington Branch out to its namesake city to the south, the Silverton Branch to the north, and a connection to the Rio Grande Southern, which lead up the west side of the San Juan mountains. The D&RGW had significant servicing facilities here due to the amount of freight passing through town. The Rio Grande Southern was the first to go, having been abandoned in 1952. The San Juan Extension - the main truck back to the rest of the rail system - and the Farmington Branch were next, coming out in 1970 due to a desire by the D&RGW to rid itself of the narrow gauge. 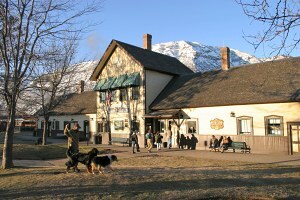 The Silverton Branch hung on, however, due to climbing tourist traffic. It continues to exist today as an isolated 45 mile branch, operated by the Durango & Silverton Narrow Gauge Railroad.